Mont-Tremblant , Quebec, Canada – February 9, 2014: Skiers are sliding down an easy slope at Mont-Tremblant Ski Resort. 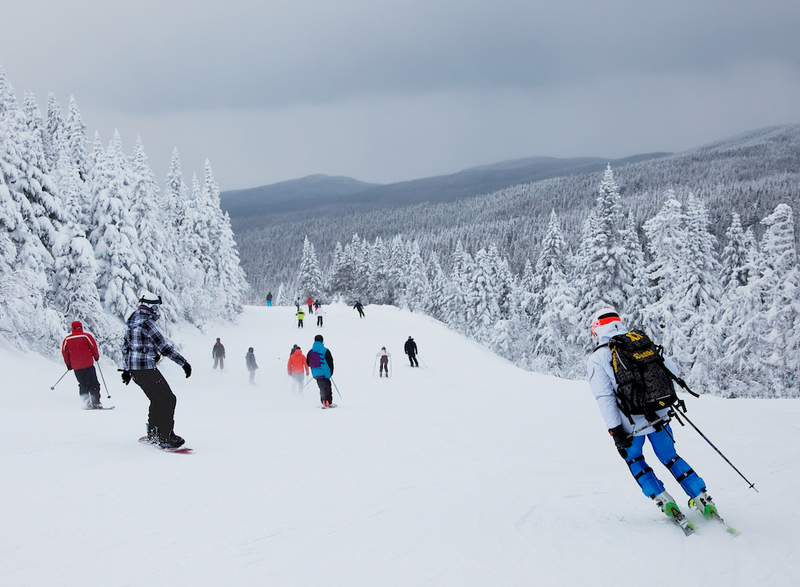 It is acknowledged by most industry experts as being the best ski resort in Eastern North America. So you’re headed to Ontario for winter but you’re unsure what to do. Fear not, we’ve got you covered. Take a look at these amazing places to visit and things to do on your winter wonderland break in this Canadian territory. Discover Ontario’s natural wonders. The state has a wealth of natural wonders to see in the winter including waterfalls which have frozen over, the magnificent Northern Lights, and the eerie but beautiful ice caves. They are all within easy reach using a Toronto car rental. Get tickets for the World Junior Hockey Championship. If you’re lucky enough to nab tickets for the World Junior Hockey Championship, you’ll be treated to some serious talent without the sky-high prices of a pro game. The event runs between late December and early January every year in Ontario. Watch a performance at the Crow’s Theatre. The recently opened Crow’s Theatre hosts some spectacular performances, music gigs, and art events which run throughout the winter season. It gets booked up well in advance though, so be sure to get your ticket early. Get out of town. If you want to escape the bustle of the city, grab a car rental Toronto to drive out to one of the wintery chalets. There’s plenty open throughout the cold months, and you can spend your days cross-country skiing or ice fishing before returning to your cozy pad complete with fireplace. Discover Toronto’s seriously cool design festival. Held in mid to late January, the Toronto Design Festival sees the city come alive with design and art which spills out of the studio’s onto the streets. If you visit during this time, you’ll be treated to work by some of the most upcoming design talent in the country. Visit a vineyard during winter. It’s always been thought of as a summer attraction, but even in winter you can head out to one of the many nearby wineries and explore the area using snowshoes and then return for tastings of some of the finest Canada reds. Settle into a night of blues. While festivals may be synonymous with summer, the Winter Folk Music Festival is breaking tradition. Throughout Toronto, you can see live blues and folk music in bars and events venues. It’s held in mid to late February. Discover artwork from established and upcoming artists. While you’re in town, consider a visit to the Artist Project Contemporary Art Fair held in late February. Here, you can admire works from more than 250 upcoming and established artists in Canada. Don your ice skates. Every Saturday throughout the winter, visitors are encouraged to head down to the Harbourfront to don ice skates and listen to tunes played out by resident and guest DJs. It’s as fun as it sounds, and you needn’t worry if you’re a first timer. Sleep in a tipi surrounded by snow. You’ve probably never thought about renting a tent during the cold winters, but at the Atelier Arboreal you’ll be treated to a true glamping experience. With heating and a bed complete with blankets, it’s more comfortable than most hotels. There’s even a sauna onsite. Ski on ghost island. While there are hundreds of places to clip on your cross-country skis, Ghost Island has some excellent trails which are covered in thick powdery snow during the winter. Hook in a catch while ice fishing. Ice fishing has long been popular in Ontario and there are plenty of places to hook in a catch close to the city. When you arrive, book yourself a cozy heated hut to warm yourself while you wait for a bite. Festivals in Niagara-on-the-Lake. With the Icewine Festival and the Days of Wine and Chocolate event as well as a plethora of snowy adventure activities, there’s never a dull moment at Niagara-on-the-Lake during the winter months. Sip on the amber nectar during winter. It may sound a little daft, but drinking beer outside during winter while warmed by fire pits at the Roundhouse Winter Craft Beer Fest is a must. You can even grab something to eat at the two-day event which usually runs in mid-February. Soak at a winter spa. Visit the Scandinave Spa located in the Blue Mountains during winter and you’ll be treated to a wealth of relaxing treatments and therapies without the high season crowds. Just pick up a car and head out to this extraordinary winter gem.